by server issues. It does not help to click the button at exactly 12 Eastern if you get a “503” error on the web page! Basically, the four of us got numbers in the 5000+ range and missed out on our first choices. The secondaries kicked in though, so we did ok. That and some scavenging throughout the day for tickets being dropped by other people means we filled out schedules with quality games. One item deserves mention; the available games as of today (May 29th, 2017) seems low to me versus other years. Some events sell out every year quickly (True Dungeon) but even a 350 seat L5R game filled in seconds. 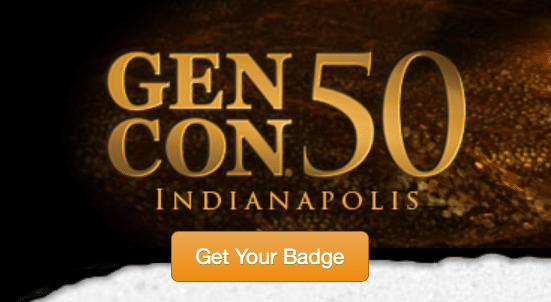 I suspect that Gencon 2017 will break attendance records. Which means the vendor hall becomes Thunderdome. I expect long line and brutal navigation. You are warned. Nothing officially planned, which is normal. We usually scrounge a pickup game. This is 18th-century horror game has been on my bucket list for years and this two-hour slot fits perfectly in the schedule. I am a huge fan of the MCG product line and I spent $500 dollars on their new “Invisible Sun” product. I hope to get a preview of the IS release and maybe some hints on upcoming products. I am also working the MCG booth for a couple of hours after the seminar. We explore an issue with a research station in Alaska using the Cypher system for RPGs. I get uneven results from this event because some of the games under test are…catastrophically terrible. That said, you never know when you might find a promising game worth backing on Kickstarter. Time to explore a mysterious statue billions of years into the future. New MCG offering with time travelers doing battle in the age of dinosaurs. Dinosaurs armed with rocket launchers! AEG runs a slot where you buy in and get some of their games to keep and a room filled with gamers to play with. Last year earned AEG much gamer wrath after the box of swag from this event turned out to be mostly air. I want to try “The Captain is Dead” and the swag is a nice bonus. Cypher system and mad science! What is not to like? This one is a new card and dice based RPG that leverages Amazon’s Alexa device in some manner. Limited information now on this odd game, but it will be broadcast on Twitch.tv, so I will be on my best behavior. This is an “1879″ game from FASA. A resurgent British Empire invades an alien dimension. Guess I am going along for the ride. A modern horror game with shades of “Delta Green.” Got a vampire problem? Then it is time to break out the claymore mines and RPGs. This list is locked in (I have tickets), but Gencon 2017 events are likely to appear over the next three months, I may shift this around as new stuff appears on the site. If I missed a game you think I cannot live without, drop me a comment. I am always open to changing my mind.